An Epic Hard Science Fiction Role Playing Game Set in the Far Future. Although we have been asleep in our dream crystals for almost 50,000 years, we have seen the comings and goings of many ages. We were part of an age of super-science and super technology. As members we could create stars and manufacture whole planets from the fabric of the universe itself. In our arrogance we thought we could do anything until one day we woke up a sleeping horde of demons. These demons, the Qualarians, were more powerful than anything we encounted before and soon our empire, the Tuluantos Empire, came to an abrupt halt. While most perished, a few found ways to survive. It took over 50,000 years to rid the universe of these Qualarians. But now is the dawn of a new age. A new set of people have woken from the ashes of the old. Although bold, arrogant, and powerful in their own right, they do not realize the delicate thread from which they hang. But these new people have an edge. They are underneath our watchful eyes as we chronicle this new age, these new people. We are the Xodar Xro Dinn. We watch this new age, an age of awakenings, unfold before our eyes. Welcome to the universe of The Xro Dinn Chronicles. This is a complete science fiction role playng game which has the mysterious Xodar Xro Dinn as a central theme. 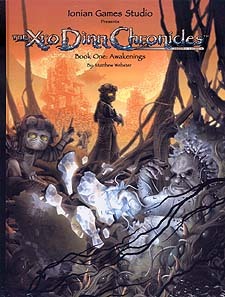 The Xro Dinn Chronicles is a versatile game designed to spark the imagination. The intricate details allows for you to choose from many different kinds of campaigns. The choice is yours. As a player, you play one of the up and coming races within the galaxy. Each race is richly detailed to bring out the flavour of the race - even the technology is tailored to fit the physiology and culture of that race.